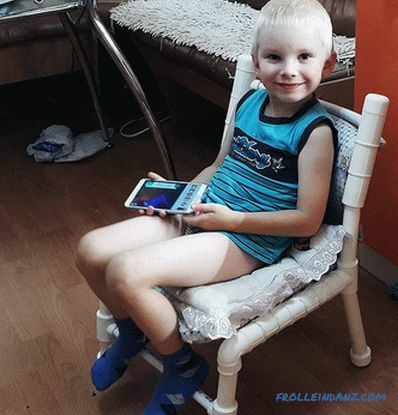 If you want to spend time comfortably, then you can’t do without comfortable chairs. 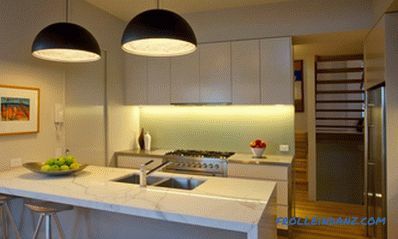 Manufacturers offer various options for such furniture for every taste, but in order to save money, many decide to make everything on their own. 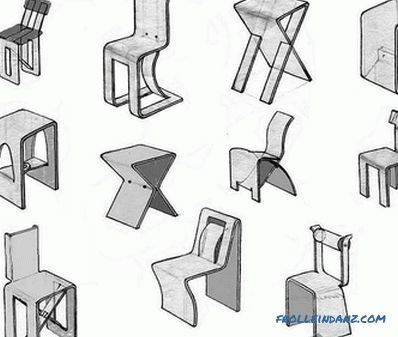 In this article, we suggest you consider several options for how to make a chair. Most often, several materials are used simultaneously. Why are logs on this list? 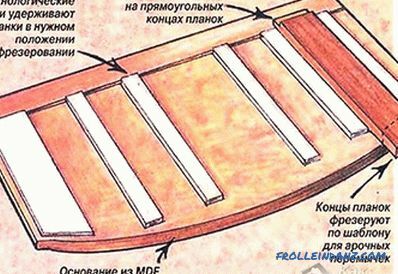 With the appropriate equipment, boards and other blanks can be made independently. 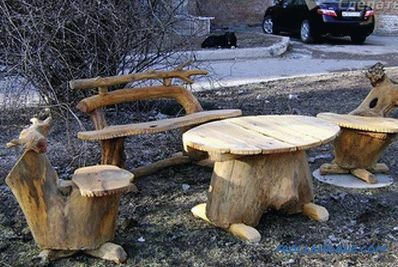 There are also original ideas on how to make a chair out of a log. Some of these ideas, you can see in the photo section at the end of the article. 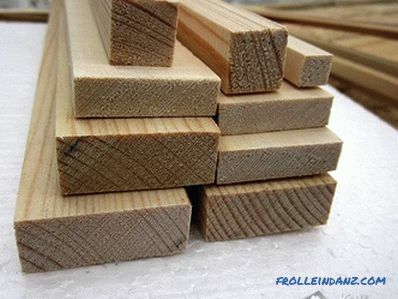 As regards the choice of lumber, it should not have knots, cracks and fungal diseases. 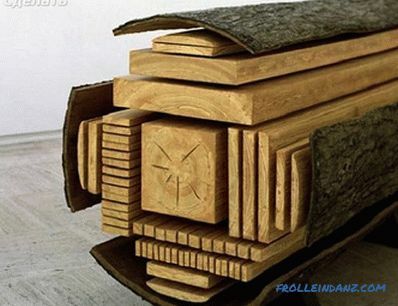 Be careful when choosing wood, as it is often tinted for a better view. 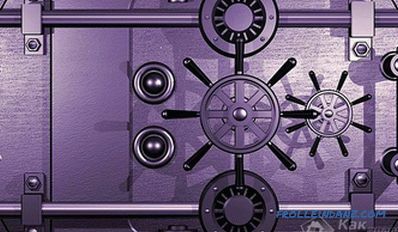 There should be no cracks in the bars, the edges should be smooth, and the material itself should be dry. Small deviations due to skewing are allowed. Boards should be up to 100 mm thick. 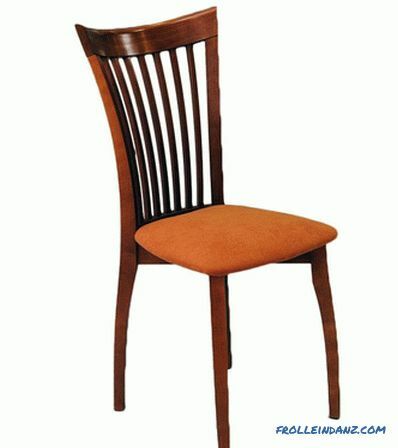 Breed of solid wood should be suitable for the manufacture of a chair. It should be strong enough and durable. 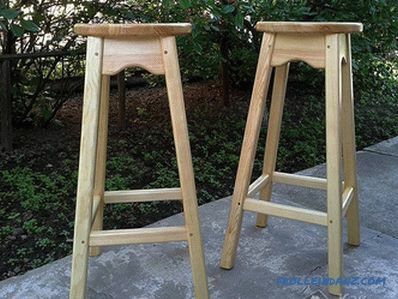 In most cases, the choice falls on an oak or mahogany. They are easy to process and are durable and durable. Pine or beech is also used. These wood species are no less in demand and practical. When purchasing, do not take all the materials abutting. Be sure to take with a small margin. 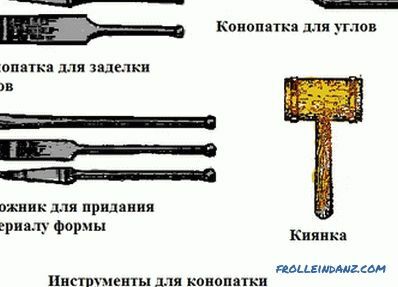 Hammer and other carpentry tools. 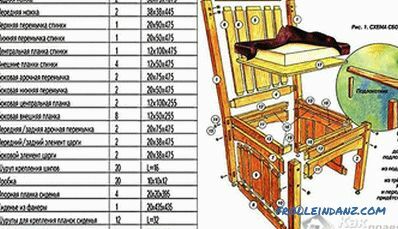 Although there are a lot of details, but in general it will be possible to assemble high-quality and durable wooden chair. The legs are cut out first. They will be 75 mm wide, 38 mm thick, and 1075 mm high. Next, find the attachment points for the horizontal jumpers. Unlike the rear legs, the front legs will be shorter. Their height is 420 mm. 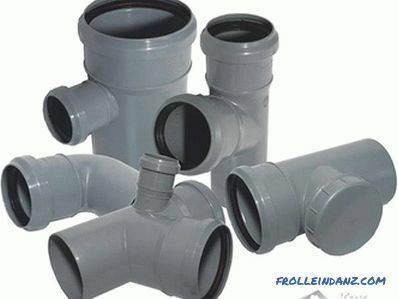 These details, like the following ones, must be carefully machined with a grinding machine. Now, using the cutter, select the grooves for joining the legs with jumpers. Everything is measured out beforehand. 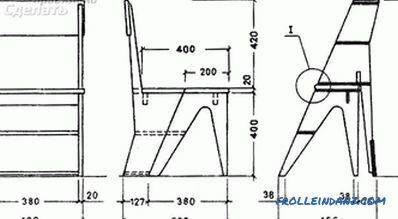 For backrest jumpers there should be 5 vertical and 2 horizontal racks 475 mm long. In horizontal stands, make grooves for fastening. Now, starting from the scheme, we make spikes on the parts with the number 3,4,5 and 6. In part number 3 from the middle to the edge, a bevel of the upper part is necessary. 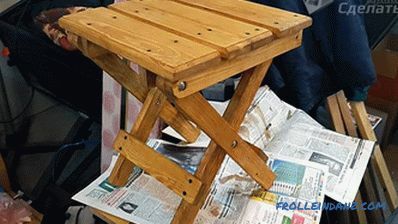 Preassemble, but without glue. So, you can correct all inaccuracies and check the spike / mortise connections. If everything fits exactly, then disassemble the back, glue all components with glue, reassemble and clamp the workpiece with a clamp. In the next step, the side inserts are made. One of them is an arched detail No. 7, the lower crossbar 8 and 9, as well as rails 9 and 10. Next, the blank is cut at number 11 for arched lintels. 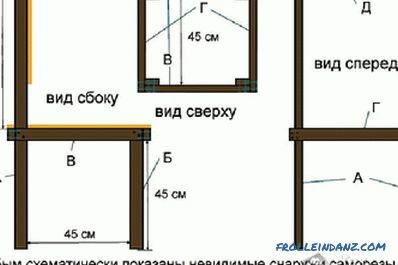 To simplify the task of manufacturing this part, you can make a pattern from MDF, since all arched elements are of equal dimensions. Next, on the arched workpieces, measure and make grooves into which the bars with studs 9 and 10 will be inserted. Accordingly, studs are made in them. Now, take all the details corresponding to number 12 and 13, on the arched blanks, cut off the spikes on the mustache. 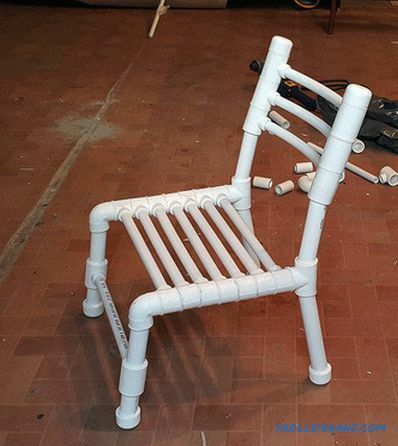 After roughing, you glue all the joints with glue and fasten this element of the chair with a clamp. When the glue is dry, the joints should additionally be strengthened with self-tapping screws, the caps of which should be closed with decorative plugs. At the next stage, work will be carried out with the bar No. 16, which is intended to support the seat. These strips are screwed with screws to the crossbar at number 18. Now that all the blanks have been assembled, it remains to assemble them into one design. First, glue the parts 11, 12 and 19 to the back leg. After that, insert the second long leg into the grooves. Having fixed a clamp, it is possible to twist self-tapping screws. Further to the finished back, glue the side panels and side elements of the tsargami. Glue the front side of the king-legs with legs and arched jumper. The resulting construction can be put on the side spikes. Check the squareness. To do this, use the square. If everything is exactly after the measurements and visually, then pull the product with a clamp and tighten the screws. Once again it is worth recalling that every detail should be carefully polished. There should be no sharp corners and all kinds of irregularities. 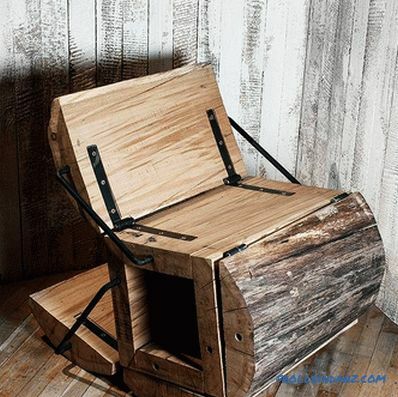 The collected chair is covered with stain and varnish (up to three layers). In this case, each coat of varnish is applied after complete drying of the previous one. In conclusion, the seat is covered with soft leather, leatherette, or other suitable material. 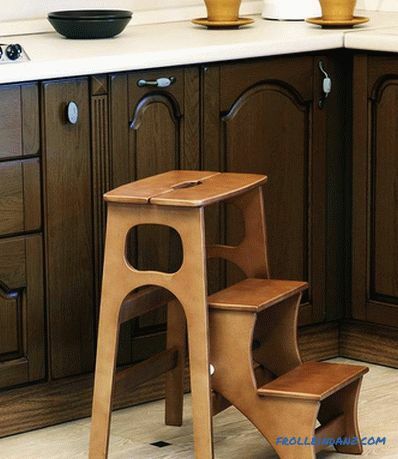 In order not to damage the floors, it is recommended to fasten rubber or felt pads on the back of the legs. For long legs, 2 bars of 900 mm each. For short legs, 2 bars of 550 mm each. For support under the seat 2 bars of 290 mm each. 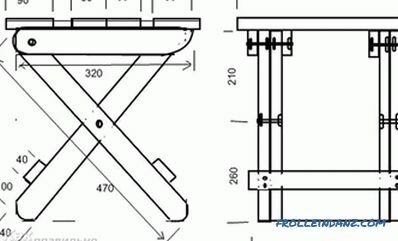 For long legs 2 cross-pieces from a board of 400 * 50 mm and 340 * 50 mm. For short legs 2 cross-pieces from a board 280 * 50 mm. 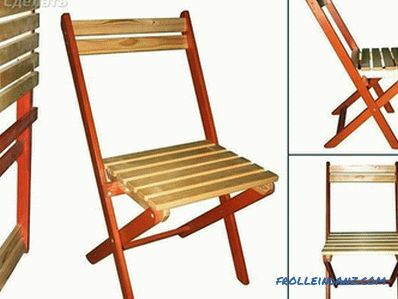 Wooden rail for backrest base 400 * 70 * 150 mm. 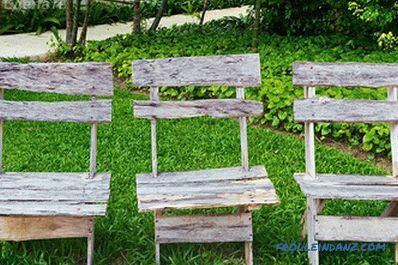 For a seat of 6 laths 340 * 40 * 150 mm. Metal bar Ø 10 mm and length 36 cm. 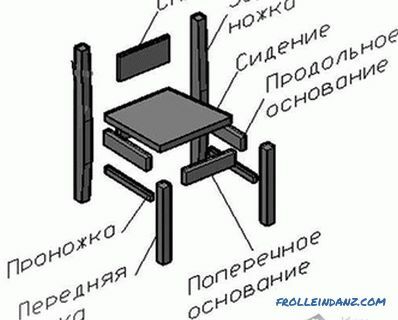 In bars designed to support the seat, drill holes for a metal rod. From the edge 40 mm, and from the supports 70 mm. After to them, the slats of the seat with a gap between them of 10 mm are fixed with screws. 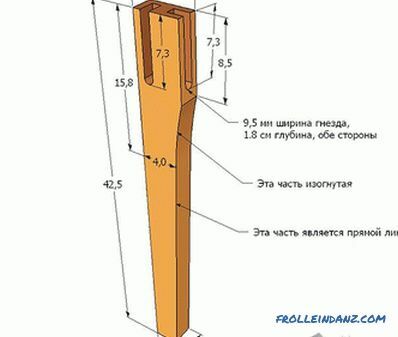 Now, with a space of 110 mm at the upper end, drill holes in the bars of the long legs. In them, stepping back 40 mm from the edge, perform zapily for the back. Drill 2 holes at the bottom. So, you can fix the cross member. The back is fixed to the upper part. You thread a metal rod into the prepared holes, which are fixed with the ends in the slots of the legs. 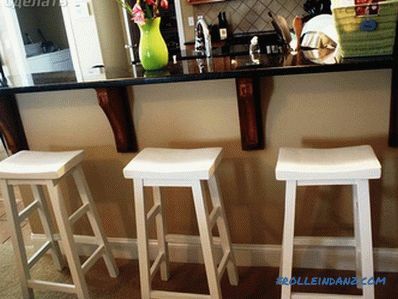 To short connect with long, in the middle of the bar for smaller legs, drill holes. Below and above the middle on the dowels are fixed cross member. Finally, all parts are fastened with screws. 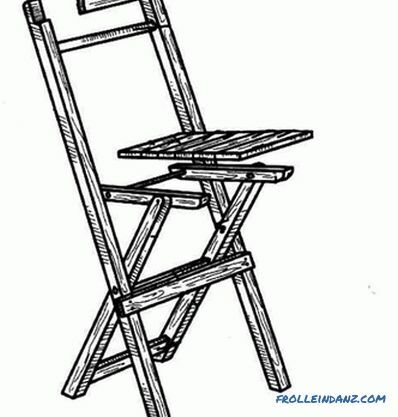 That's how a folding chair is made. 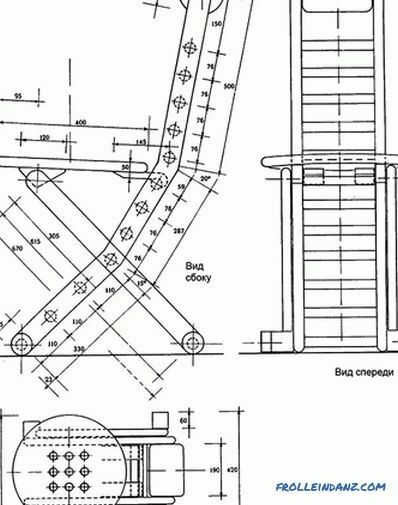 Other details and subtleties of the assembly can be seen in the presented videos. 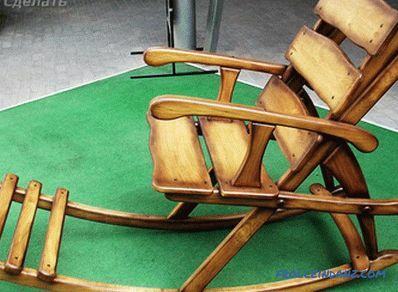 So, we have considered various options for an exciting process of making a chair out of wood. 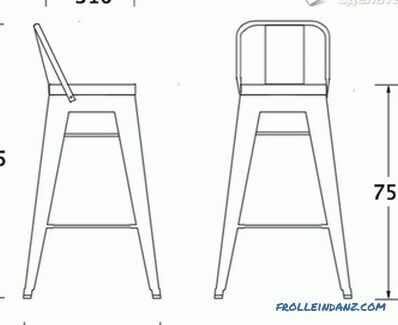 Be sure that you will be quite able to assemble a similar product. If you have other ideas, write comments to this article. 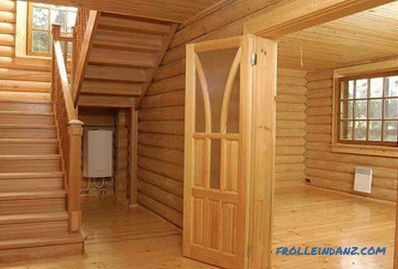 If you want to find out about original solutions, there are several ideas in the photo gallery.